he is definitely wrong- God is Alive! If I were a scientist, I'd stick to the Goldman Sachs principle: bet on both sides. "Believe in science, believe in God" seems to cover all the possibilities and gives you the best chance for a cheery afterlife. For a time, it was thought that astrophysicist Stephen Hawking had also left a tiny gap in his credo window for a magical deity. However, he has now come out and declared that there is no God. He gave an interview to Spain's El Mundo in which he expressed his firm belief that el mundo was the work of scientifically explainable phenomena, not of a supreme being. Hawking said: "Before we understand science, it is natural to believe that God created the universe. But now science offers a more convincing explanation." I'm not sure whether there was a specific moment in which science overtook the deistic explanation of existence. However, El Mundo pressed him on the suggestion in "A Brief History of Time" that a unifying theory of science would help mankind "know the mind of God." Hawking now explained: "What I meant by 'we would know the mind of God' is, we would know everything that God would know, if there were a God. Which there isn't. I'm an atheist." He added: "Religion believes in miracles, but these aren't compatible with science." Perhaps. But some look at, for example, the human eye and wonder how that exciting ball of jelly could have come about scientifically. Hawking's been tending toward such an absolute pronouncement for a while. In a speech last year, he offered an explanation of how the world came to being without God. He mused: "What was God doing before the divine creation? Was he preparing hell for people who asked such questions?" I do worry, though, about Hawking's sweetly divine faith in humanity. He told El Mundo: "In my opinion, there is no aspect of reality beyond the reach of the human mind." If that's true, the human mind still has to develop exponentially to explain everyday phenomena, such as social networking. 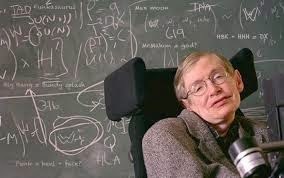 And then there's Hawking's insistence that his speech synthesizer, which gives him a curiously American accent, has had this consequence: "With the American accent, I've had far more success with women." We definitely need some serious research to explain that. My Question To Adolf Nicholas S.J. Jesuits Ignore one of their 'greatest' leaders: Wlodimir Ledochowski S.J. Ignatius Loyola's Visions Of A Serpent! Childhood Revenge Vow to Destroy Prussia? JFK assassinated to keep I-95 away from Catholic University of America? Explaining People as FDR, Clinton, Bush, etc. Jesuitical Medievalist Government Within Washington, D.C. Put In Practices Nuking USA Northeast? A Trip Within Their Washington, D.C.
Blog no longer updated - This blog is no longer updated. Please visit my new blog for new entries. Reopened - The blog Novus Ordo Seclorum has reopened. Gestig Frei- Jesuit Superior General/ Black Pope Satan's Henchman? The UnHived Mind- America's Coming Secret Police Force- Be Warned!